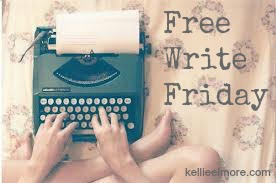 It’s Free Write Friday and this week Kellie Elmore has issued a word bank challenge. Mirabel stepped off the front porch step to the pebbled path way and stopped. She took a deep breath and held it for a moment, and then released. The air was bright with the sharp scent of rain-drenched foliage. It was a heady fragrance, filling her with a sense of gratitude for another summer past and the fullness of life represented by autumn. Summer’s last gasp, she liked to call it, shooting flames of colour through the woods. “Remember me! Remember me!” the dying season seemed to say. 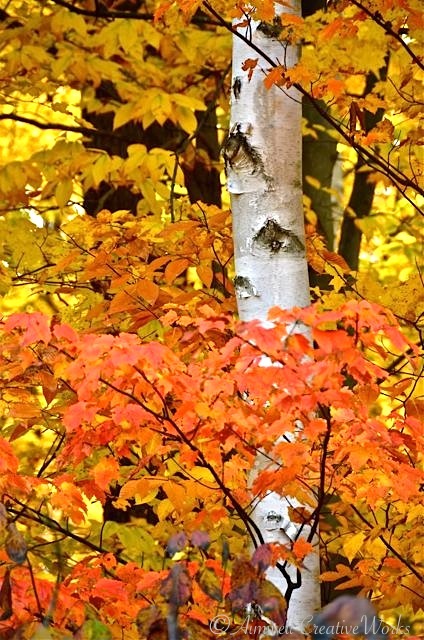 A canopy of amber, crimson, rust foretelling the arrival of a season of frigid dormancy. Winter wasn’t Mirabel’s thing. She preferred long rides on her horse through the withering woods, with the crunch of freshly, fallen leaves beneath Cally’s hooves; the sparkle of sunlight scoring through baring branches; and the soft, warm fragrance of the dying summer flooding her senses. Autumn was the season of senses. 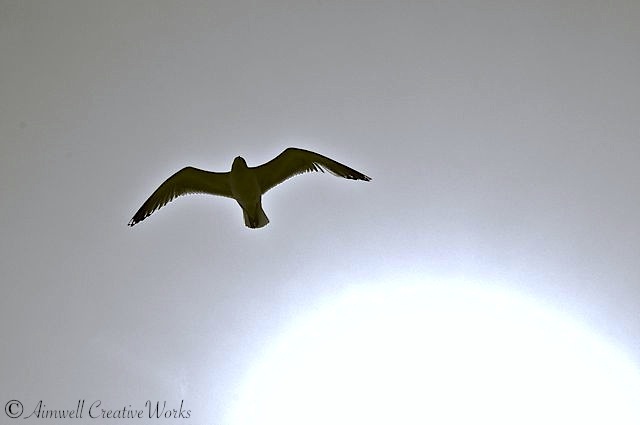 She stretched her arms out to the side like a flying bird and tilted her head up to the sky, closing her eyes as if to take in the changing season even more deeply. To feel its dampness on her skin; hear the call of migrating geese in her ears; smell the sweet decay of summer’s rotting blooms. She could almost taste it so heightened were the flavours of fall by remnants of rain. A drop here. A drop there. 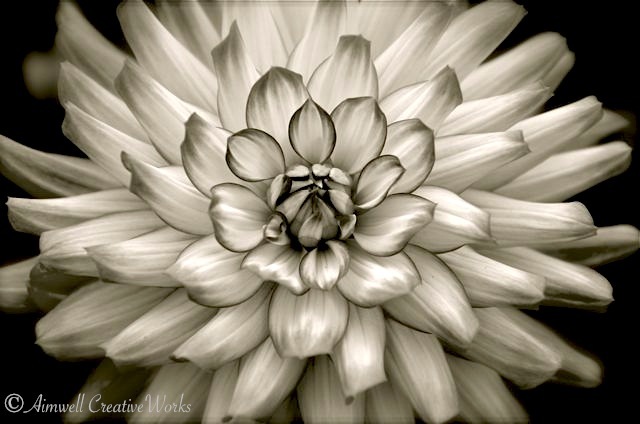 On her forehead; her eye lids; her cheeks; the back of her outstretched hands. She opened her eyes. It was true. The spit-fall of rain drops had started again. She turned and climbed the stairs to the covered porch and settled into her wicker rocking chair. Pulling her favourite Arran sweater tighter about her to ward off the damp chill, she observed the rainy scene for some time before realizing that what she really wanted, right now, was for someone to bring her a lovely hot mug of cocoa. Free writing is a great exercise and a little more challenging when the memory is involved. As mentioned in my last Free Write Friday post on the Childhood Gift, my childhood is very much a blur. During last week’s free writing exercise I couldn’t think of anything to share besides the bear story. Which is fine ~ it’s a nice story. Somehow, though, it left me feeling empty. The fact is, my mother had given something of great meaning to me when I was a child (besides a roof over our heads, food at the table and a youth steeped in culture), but what it was I just could not recall through the fog of memory while trying to free write on the topic. That was until a memory jogging discussion with my therapist on Tuesday reminded me of a special gift I still have and that means the world to me. I’m actually surprised I didn’t think of it as it’s within eyeshot every day. I don’t recall the exact age I received this thoughtful gift. Maybe nine years old. And I don’t even remember how it was given to me. Perhaps for my birthday. When my mother toured with the opera company she would frequent antique shops in the various British cities she visited. She would often return home, after a few days away, with easily transportable items she hadn’t been able to resist, like old picture frames and glassware. I didn’t pay this much mind until one day she presented me with a gold-leaf antique frame bearing a print of “The Arab Tent” by Edwin (Henry) Landseer (1802-1873). The beautiful print she purchased at the gift shop of the The Wallace Collection in London, where the original is on display. 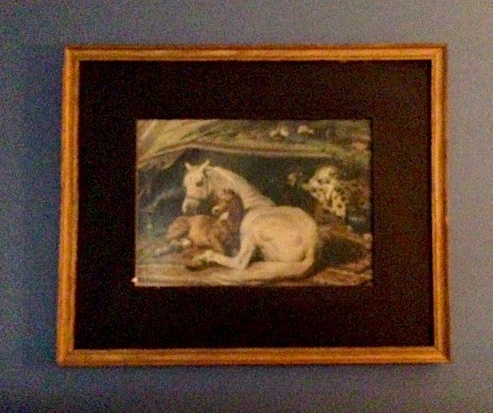 This beautiful print of a grey Arabian mare and her bay colt sheltered in an Arab tent took pride of place on my bedroom wall throughout my formative years. Now, despite more life-altering physical moves than I care to remember during which I lost or misplaced many possessions, it somehow graces a wall in our family room. 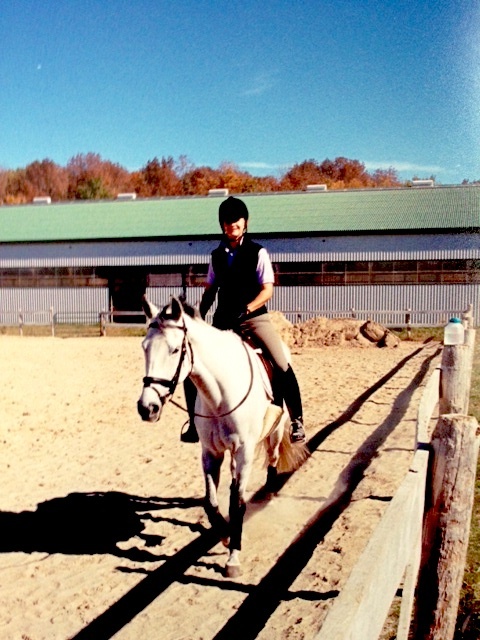 Before Bear arrived in my life I was part-boarding a beautiful grey thoroughbred mare called Murphy. 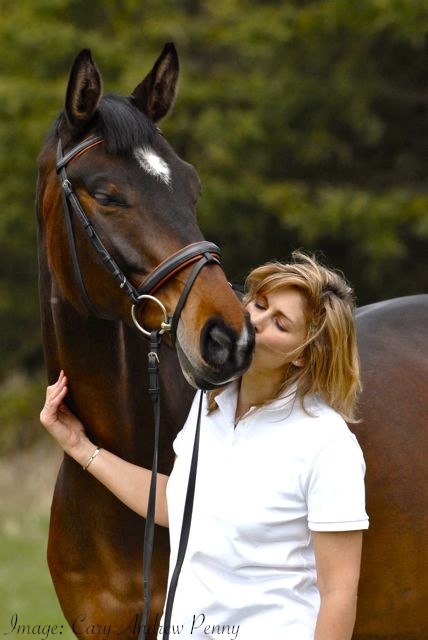 For two years she felt like she was my horse and her owner was happy for me to treat her as such. In the spring of the second year, Murphy became quite ill. We didn’t know what was wrong with her and for several months she was on-again/off-again with work. By autumn she was dropping weight rapidly and a trip to the equine hospital was in order. She arrived on a Thursday. Within a day and after several tests she was diagnosed with cancer of the peritoneum (lining of the heart). She was dropping weight by the minute. By Saturday she was dead; euthanized. There was no staying the tide of that terrible disease. Her loss was devastating to me. I took two weeks off from riding and then, determined to get back in the saddle, started riding school horses again. Then, about a month later, my future husband suggested it was time to turn my life-long dream of having a horse into reality. Three months later Bear entered our lives. Going back to The Arab Tent for a moment, what amazes me is how prophetic this beautiful piece of art seems ~ like a mysterious foreshadowing of what was going to be. My experience with the grey mare (Murphy) gave birth to the brown colt (Bear). I get goosebumps just thinking of it. Now every time I gaze upon The Arab Tent in my family room, I am reminded of these two beautiful horses that have graced and brought important meaning to my life, and how their coming was, seemingly, pre-destined. All that remains is for me to view the original of The Arab Tent at The Wallace Collection. I hope that day comes soon. God works in mysterious ways His wonders to perform. I’ve experienced enough of life so far to believe this with my whole heart. You just never know the profound significance of a simple gift. I’m so glad I remembered this piece of my life and my mother’s role in it. Daily Prompt: What’s in my Name? To those who do not believe in God, this probably won’t mean much. My strong belief in God, however, makes this name particularly meaningful to me, even if, at times, I have felt it terribly old fashioned for the era in which I live. I have contemplated changing it to something more hip many times, and considered shortened versions, but they just don’t want to stick. When I was a little girl of three my parents and I were visiting San Francisco Zoo. Apparently, towards the end of our visit, I got quite tired of walking and turned to my father, looked up and said, “Poor Dofy …”. I was carried the rest of the way. Occasionally a family member might address me affectionately by this name. Very occasionally. I will not tolerate Dot or Dotty. I am told, by my mother, that I was named after my godmother (ironically enough), someone with whom I am still in occasional contact, though we are not close. Dorothy is also easily translated into Hungarian (Dorotya) and as half my heritage originates in that country it stands to reason that my name might have some link to that culture. However, I am not aware of any of my female Hungarian ancestors having that name, nor that my parents had this in mind, particularly, when considering my moniker. I have tried to adapt this into a nickname as well but again, nothing sticks. I am Dorothy, through and through. This name reflects my deep and abiding faith in a power greater than I that has, through all my life’s ups and downs, been my rock. Daily Prompt: Name that … You!